I was trying to come up with some easy Easter crafts for the boys. I wasn't in the mood to drag out all kinds of craft supplies and end up having to clean up a big mess. They really liked making the paper snowflakes during the winter, so I thought we would try the same method to make Easter eggs. 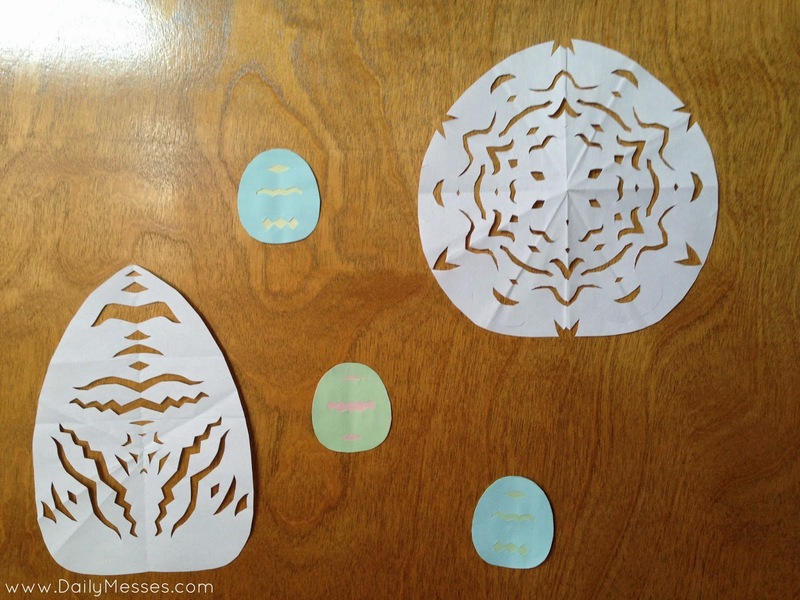 I cut an egg shape out of paper and folded it similar to what I did with the snowflakes. I didn't fold it as much for Higgins, since he couldn't cut through all the layers. You can cut on the folded edges, but make sure not to cut all of the folded parts off or your egg will fall apart! For some of the smaller eggs, we used colorful Post-It notes. We folded two together and cut out a pattern. Then we placed a different color of paper in between the layers to add even more color and to help the design pop out a little more. We ended up just hanging them on the door with the larger eggs, but they would make a cute garland or place settings as well!